Falk Firebeard is a Nord warrior and the personal steward to Elisif the Fair, the Jarl of Haafingar. With Elisif in mourning after the death of High King Torygg, Falk Firebeard oversees all court business and will provide you with quite a few tasks on her behalf, in particular the unfortunate return of The Wolf Queen. He will also sell you Proudspire Manor, the most expensive house available for purchase in Skyrim. Elisif the Fair rules Skyrim from her seat in the Solitude's Blue Palace and Falk is by her side at all times, listening to various citizens as they approach, while doing his best to dodge Elisif's rushed ideas and convince the other court members that Elisif is fit for the job. He never pauses to eat or sleep, although he was intended to (see bugs section for details). His wardrobe befits his role as steward and includes fine clothes and matching boots. He wields a steel sword and carries a belted tunic along with an assortment of upper-class items, food and gold. When you meet him for the first time, he will greet you formally with: "Do you have business with the court? ", "I am the Jarl's Steward. If you have court business to tend to, you talk to me." and "The Jarl is not to be disturbed with common affairs of court. You direct those concerns to me." You can then ask him about where he stands in the many issues related to Torygg's murder and the fact that the Imperial Legion and General Tullius fight the civil war from their headquarters in Solitude. When asked specifically if Tullius likes Elisif, he will hint at the many different opinions within the court: "Of course he does. What sort of a question is that? Maybe you've been listening to Erikur. There's been loose talk among some of the Thanes, and I suspect he's the cause of it. You'll pay those rumors no heed if you wish to retain your welcome in this city. She may be young, but Elisif is the Jarl by right. And here in Skyrim, if nothing else, we respect the traditions of our father's fathers. You'd do well to remember that." He will also share his thoughts about where Elisif stands if the war is unresolved: "That remains to be seen. By rights, she has a legitimate claim as High Queen of Skyrim. But we must have the support of the other Jarls for that claim to have any meaning. Should they accept her rule, we will have peace." He will bid you farewell with "Feel free to return to me with questions. The Blue Palace is an open forum." and "Please feel welcome in the court of Solitude." As you progress in the game, Falk will elaborate even more on the situation concerning Elisif and will explain why she relies on him to make decisions: "She still mourns greatly for her husband, High King Torygg. So she leaves many of the courtly details to me." 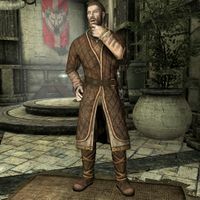 Should the Stormcloaks win the war, he will provide his theory on why Ulfric Stormcloak chose to spare Elisif: "Because killing her would yield no political advantage. By leaving Elisif alive, Ulfric completes the separation of the Empire and Skyrim. With Ulfric's troops here, Elisif will be forced to support his bid for High King. He secures the position and appears above reproach. What's more, Ulfric's refusal to execute his slain enemy's wife will be portrayed as the ultimate act of compassion. Hmph. It's genius, really." He'll also reflect on what will happen to Elisif: "Well... By rights, she had a legitimate claim as High Queen of Skyrim. But now Skyrim is at Ulfric's mercy. The moot will meet and choose Ulfric as High King. With his troops in most of the cities, they have little choice." If the Legion won the war, he was supposed to say: "That's the real question, isn't it? No one can deny Elisif has a legitimate claim to become High Queen of Skyrim..." before adding "But we must have the support of the other Jarls for that claim to have any meaning. Should they accept her rule, we will have peace." However, this is never heard because the conditions for the dialogue are incorrect. In addition to his involvement with the return of Potema, he plays a small part in two other quests, whereas the Delivery quest reveals his love for a special brand of rum, the rare Stros M'Kai Rum. Sorex Vinius will hand you a bottle and ask you to deliver it to Falk. When you hand it over, Falk will become quite excited, hand you a leveled gold reward, and tell you about his journey to Hammerfell: "Oh right, the rum. Thank you. I developed a taste for it after a fair weather trip to Hammerfell. Here, this is for you." During the Mind of Madness quest, Dervenin will send you into the Blue Palace where you are supposed to gain access to the Pelagius Wing. When you confront Falk with the request he will reject: "Absolutely not. That wing has been sealed for hundreds of years, and for good reason. They say the ghost of Pelagius the Mad still haunts it. Ghost or not, there are reminders of his dark rule that are best left buried away." However, if you have completed enough of his other quests, you can convince him and he will reluctantly hand you the key: "I'll make an exception for you, but do not bring anything out when you leave. Too many dark deeds transpired in those halls..."
Falk: "Perhaps a more... tempered reaction... might be called for?" A relieved Varnius will then return to Dragon Bridge, unaware that most of the court will ignore his request. Asking Falk Firebeard about the issue will make him say: "You mean the Dragon Bridge issue? I'll be honest with you, I was planning to let that go. Varnius is a bit jumpy at the best of times. There have been reports of weird happenings near Wolfskull Cave. Travelers disappearing, odd lights. I suspect wild animals or perhaps bandits. I don't think it's worth our time with the war going on, but if you want to clear out the cave, I'll make sure you're repaid for your work." This starts the quest The Man Who Cried Wolf. He will also explain how the cave earned its name: "The cave has a bad history. Long ago, Potema the Wolf Queen used it for necromantic rituals. That's where it got the name. That was over 500 years ago. Nothing much down there now - but everyone's always convinced the cave is haunted." When you return to Falk after discovering the truth behind the occurrences in Wulfskull Cave, he will greet you with: "You've returned. Good. What did you find at Wolfskull Cave?" However, he will be shocked to learn that necromancers tried to summon Potema: "Potema herself? Please tell me you stopped them." When you tell him you managed to interrupt the ritual he will hand you a leveled amount of gold and say, "You've done a larger service to the realm than you could possibly know. A resurrected Potema... I shudder at the thought." He will bid you farewell with a grateful "Anyone with a stout heart like yours is welcome here." A few days later, a courier will deliver a letter from Falk Firebeard suggesting that the trouble with the summoned wolf queen is far from over. When you meet with him and mention the letter, he will start the quest The Wolf Queen Awakened and explain: "Yes, old friend, I'm afraid it's not good news. When you broke up the binding Potema escaped. We've encountered some of her minions. Styrr says she's still in spirit form or we'd all be dead already. You've already done us a service in stopping the binding, but I need you to go talk to him, to see if Styrr can tell us what to do next." When asked about Styrr he will say: "He's Solitude's priest of Arkay. He's the one who figured out Potema was still around. He'll help as much as he can." If you ask him why they chose you for this job, he will attempt to explain:" I'm not really sure. Styrr thinks you have some sort of link to Potema. I trust his judgment on this. As a priest of Arkay he's had to deal with necromancy before. Nothing as dangerous as Potema though." When you accept the job he will be grateful: "I wish you well friend. Be careful." When you return from the Solitude Catacombs, Falk will wholeheartedly thank you: "You've done a great thing, today. It doesn't matter who you support in the war; Potema would have been a blight on the land for both sides. Without you this would have been a disaster. I should have paid more heed to Varnius' warnings. I won't make that mistake again. Take this payment - the Jarl would thank you but she very much wants to keep Potema's return quiet. Make no mistake we consider you a protector of Solitude." He will bid you farewell with "I won't forget what you've done for Solitude." Falk carries the letter that starts The Wolf Queen Awakened in his inventory when the game begins. This is a second copy of the letter, as he keeps it on his person even after the quest has been completed. Falk was supposed to have a more normal schedule; he would get out of bed at 6am and spend sixteen hours in the throne room. He was then supposed to wander around for two hours before his bedtime at midnight. His night was supposed to include a secret visit to Bryling between 2am and 4am, as hinted by Sybille Stentor in the conversations below, and another conversation he has with Bryling. This conversation is supposed to take place outside of the palace, but may occur inappropriately right in front of the other courtiers. Elisif: "Steward, I have an idea that might help to bolster the morale of our people in this difficult time. I think we shall have a grand parade, and let General Tullius march his troops from the Blue Palace to Castle Dour in all their finery." Falk: "What a... fine idea, my Jarl. However, I would suggest we wait until the war has ended. After all, the General needs his soldiers out in the field, fighting battles against the Stormcloaks." Bolgeir: "I must protest, my Jarl. A parade would make you an easy target for a Stormcloak assassin. You're safer here in the palace." Elisif: "Oh, very well. I can see there's no changing your stubborn Nord minds. But when this war is won, I will have my parade!" Elisif: "Steward Falk, I have a task for you. I want to begin stockpiling food and water in the event we come under siege, and I would like you to oversee this work personally." Falk: "A wise course of action, my Jarl. However, we have little food or water to spare." Erikur: "General Tullius will never allow that. He's ordered all surplus food to be given over for the war effort." Falk: "General Tullius does not run this city, Thane Erikur. Or have you forgotten your oaths of fealty?" 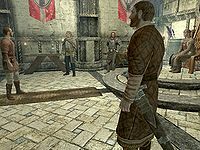 Erikur: "My apologies, Jarl Elisif. I was thinking only of the importance of the war effort." Elisif: "There's no need for an apology, and you're right about the war. Perhaps this is a matter best discussed with with [sic] the general in person." Falk: "I will make the arrangements, my Jarl." Elisif: "Steward, when is my appointment to meet with General Tullius? There are some issues we must speak about." Falk: "I'm afraid he's had to reschedule, my grace. By all accounts, waging war takes his every moment." Elisif: "Again? He can't simply cancel an appointment with the Jarl! He serves in my capital city!" Falk: "I'm afraid he can. His authority comes from the emperor. Who you also serve, technically." Elisif: "He uses all of Haafingar's resources, and doesn't answer to me in the slightest? This hardly seems fair." Falk: ""Fair" is a word rarely applied to politics, my grace. I'm afraid you must learn to accept this." Erikur: "I've heard the Empire plans to levy a tax on our trading ships. Falk, you've got to do something about this." Falk: "General Tullius needs more money for the war effort. We need the funds to arm and provision more troops." Erikur: "Then let's increase the taxes on the farms and merchants. We can't afford to lose the loyalty of the ship captains." Falk: "We know full well about your investment in shipping ventures, Erikur. I've also heard troubling rumors about dealings between you and the crew of that pirate ship, the Red Wave. Thankfully, Jarl Elisif cares far less about your lost profits than she does about winning the war!" Erikur: "The Jarl would be wise to remember that it is her thanes - and my profits - that are paying for this war." Bryling: "Falk, you shouldn't have come. You know what'd happen if people found out about us." Falk: "I know, my lady. I just needed to see you outside of court, away from all of the politics." Bryling: "I'm serious. If Erikur knew about us, he'd force you to resign from your position. And without you, he'd have the Jarl bent around his little finger." Falk: "You're right, of course. But when this war is over, I'll gladly resign and we can stop sneaking around like this." Bryling: "One more reason to pray for the fighting to end then, my love." Bryling: "There's something that's been troubling me, Falk. I am hesitant to share it, but I feel that I must." Falk: "Speak your mind, Bryling. You're among friends here." Bryling: "You know that I support the Empire, as we all do. However, I fear General Tullius is underestimating the Stormcloaks. Too often the general has lost good soldiers because he did not take Ulfric and his men seriously. If this continues, and the worst comes to pass, Solitude will pay the price. The Empire is headquartered here, after all." Falk: "We don't have the luxury of hanging back to see who wins before choosing our friends, Bryling. You know this. And besides, no Nord with a shred of honor would consider it. We're no cowards. Have faith, Bryling. When this war is over and Ulfric is dead, you'll see that you were jumping at shadows, and nothing more." This page was last modified on 22 June 2018, at 04:51.